Atlanta pop rock quartet The Waiting are no amateurs in the music industry. 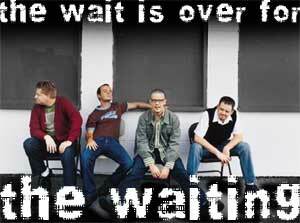 Since the mid nineties, The Waiting has been making an impact on fans across the globe with their uplifting pop rock. Recently, guitarist Todd Olsen took a moment to share a little about their latest album Wonderfully Made. JFH: Why the name "The Waiting?" Todd Olsen: When my brother, Brad (the lead singer and primary songwriter), and I were forming the band and going through the name selection process, I stumbled upon a lyric from a Tom Petty song (I'm a big Tom Petty fan). The lyric was "The waiting is the hardest part." I loved that and it describes so well our often impatience with God. We often joke in our band that we should have named ourselves "Hurry Up!" Jesus freak Hideout: What artists would you say have influenced your sound? Todd: We all love Bob Dylan, Tom Petty, U2, The Police, Keith Green. JFH: How did a number of song writers and 3 diverse producers help shape your latest album, Wonderfully Made? Todd: We were blessed to have a long time to make this record. We started this record with just the four of us band members, no record company people, no outside producers - just us four, locked in a little studio in Atlanta. We wanted this record to be what we wanted, not anyone else's agenda. After writing and tracking the songs by ourselves for a year, we (through the help of inpop) began working with the great producer Bryan Lenox. He helped us put polish on the record. I learned so much from being in the studio with him day to day. Brad began co-writing some songs with Third Day's Mac Powell, which are all great songs! We ended up using four of them on this project. Brad also wrote with some other folks, a worship leader from England, etc. Another big influence on this project is Duncan Phillips. He's with Newsboys of course, but he also A&R'd this project for us. He was in the studio helping us with artistic direction, etc. His input was invaluable to us. JFH: Why has it been three years since the last Waiting offering? Todd: See above (ha ha) not to mention Brad began work as a youth pastor at a church in Atlanta and he and his wife had their first baby! JFH: What prompted the switch from home label Sparrow over to Inpop? Todd: We had some close ties with inpop. We toured with Newsboys on their Step Up To The Microphone tour and got to know the band real well. They are closely tied-in to inpop. Our former manager works for inpop. So, it was real natural to sign with them. They had the same vision as we did. JFH: Although probably a common topic, how much of a part did Mac Powell play in the creation of your new record and how did you guys team up? Todd: The Waiting and Third Day both opened up the Newsboys' Step Up To The Microphone tour. That's when Brad and Mac started talking about co-writing. We've actually known Third Day forever. We both came up together as "Atlanta-bands." Most of us have been roommates at one time or another! JFH: What inspired the song "Sleepless?" Todd: Boy that song is sure getting the buzz on this record! Brad wrote this song while we were on a road trip. He was sitting in a hotel room and turned on the news. The lead story was about one of the lesser-known shooting sprees - a guy shot up a day trading place in Atlanta where we live. One of the guys that he killed was a member of Brad's church. The lyric is really about Brad's frustration about how the world deals with those tragedies. They blame it on teen angst, or what parents failed to do. And all those deficiencies may have contributed, but the root cause of all of it was just sin. It is even more poignant now with what's happened at the World Trade Center. Sin keeps rearing its ugly head. Even though Jesus died to take care of it, we still manage to make our way back to it. Chris Falson, a worship leader from England, helped Brad finish up the song. Todd: I was at home in Atlanta. It was very sobering and made me rethink all my relationships and reflect on how important the people in my life are to me. Also, it made me think about our country and world situation in a new way-- realizing the world IS a dangerous place, and that makes me actually want to put myself more in God's hands. Todd: Not a prerequisite-- but it helps! JFH: How has fatherhood changed the applicable members of the band as a person? Todd: Brad often talks in interviews about how having a child makes him understand God's unconditional love for us even more. JFH: What is your favorite song on Wonderfully Made? Todd: I like the title track-- such an uplifting song-- so positive! I think Brad struck a chord in me with that one. Todd: Mainstage at Cornerstone festival-- unforgettable! JFH: What is the band's favorite thing to do in their spare time? Todd: We love our Atlanta-band friends, Smalltown Poets and Third Day. Todd: Hi and thanks to everyone for supporting us!